Nothing good comes of having your status as capital snatched from you by Delhi. As a Calcuttan I know the pain. Of course, my city’s had it relatively easy when you consider the fate of Sasaram in Bihar. That’s where Afghan warlord (what a useful phrase: right from Bihar in the 16th century to the US invasion in the 21st) Sher Shah Suri had his capital, as ruler of Bengal and Bihar, before he overthrew Humayun and moved shop to the Purani Qila in Delhi. Unlike the Afghan warlords of today though, Sher Shah was a pretty impressive ruler. He introduced the rupiya which was the predecessor of the modern rupee. More interestingly, he introduced a small denomination coin called the dam which probably gave rise to the English phrase “I don’t give a damn”. The administrative set-up introduced by him was so impressive that Akbar copied liberally from it and Sher Shah’s ideas therefore ruled India for centuries after the man’s death. Six hundred years later though, Sasaram is yet to get over the rejection of being passed over for Delhi (that three hundred years later, yet another empire would use Bengal and Bihar as stepping stones to capture Delhi is something that we will get into—to use an Ayesha Jala phrase, Bengal has always been a “milch cow” for Delhi). The town is, to not put too fine a point on it, in shambles. It’s congested, ugly, has no power or water and, most egregiously, has no good food. All you get in restaurants is a really bad Punjabi/Mughlai pastiche: Do-Pyazas, Mattar Mushrooms and Dal Tarkas. (I don’t mind Punjabi but India’s self-destructive obsession with it baffles me.) The only exception to this was the chai I found at a roadside stall quite by chance. It was boiled just the right amount with not too much milk (the bane of chai in small town India). And while it was too sweet for my comfort, a little bit of cajoling and a small white lie (“I have diabetes”) later I had them brewing me a fresh sugarless pot. Sadly there is no place to enjoy that chai in comfort. The town centre is a seething mass of chaos: Cars. Samosa shops. Banana vendors. Autos. Children. Lorrys. The bloody autos in Sasaram insist on putting in the shrillest horns they can find and then blow them CONTINUOUSLY as they pass through. In spite of all this effort though, they are pretty much blown out of the water when a lorry passes through blowing its shrill horn CONTINUOUSLY. The day I visited, just in case there it wasn’t chaotic enough, there was an RJD politician berating Nitish Kumar for, interestingly, being a casteist. “Doesn’t a poor child of a forward caste feel hungry”, thundered the man on a very loud mic to make himself be heard over all the noise. Shoe on other foot and all that I thought through my headache. Unfortunately, going through the town square is a must in order to visit Mr. Suri’s impressive tomb. Placed in the centre of an artificial lake, the first thing that strikes you is its lack of ostentation. Pretty is not a word you would use to describe the tomb. More like spartan, rugged or muscular. If the Taj Mahal were Chitrangada Singh, pretty and elegant, Suri’s Maqbara is more Schwarzenegger. The closest structure it reminded me of are the tombs in the Lodhi Gardens in Delhi, the Sasaram tomb of course being far more impressive and has far fewer rich Delhi-ites jogging around it. 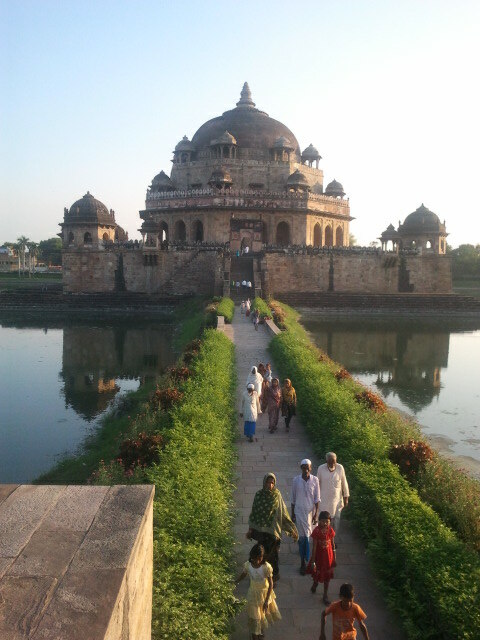 Made of sandstone, the tomb’s pretty big, around 150 feet high. It stands on a square platform which leads down to the water in the form of steps. The domed chamber itself is octagonal and has entrances on seven sides the eighth being a Mehrab sort of wall niche. The chamber is surrounded by a pillared verandah of sorts decorated by the usual graffiti you find at monuments. The most interesting piece of "graffiti" though is a stone plaque put up by the British in 1882 which boastfully proclaims that the tomb was repaired by the British Government. The chamber houses a number of graves the largest being Sher Shah’s. Oddly, none of them point towards the Qibla. Interestingly, Suri’s grave has been mazaar-ified. There’s a rich red-rimmed green chadar spread over it which is in turn covered with small change (the highest denomination note was a 20). The guard later explained that this wasn’t because people weren’t generous but it was because it’s tough to keep an eye on things all the time and some people have frisky fingers. There were also a couple of chaadars on the wall in case you wanted to do a bit of spreading yourself “all free of cost”, said the guard in a tone which was to indicate he expected to be tipped. Not wanting to colour his answer, I prevaricated and mumbled something unintelligible. I nodded. This was sound logic; couldn’t argue with it. Turning down yet another offer to tip Sher Shah Suri and impressed by Bindeshwar’s theory of the fundamental relationship between power and religion I headed back to the city—I could hear the autos of Sasaram beckoning shrilly to me. you are a very funny guy. Keep it up. Hie, this is a great blog.. one of my favourites!! Had read this one on Kafila. Didnt know it was you, but I remember telling myself this guy can be funny writing well !